BJ Penn inflicted one of the most devastating knockouts of his career on Matt Hughes at UFC 123, and then instantly got handed another stiff welterweight clash by president Dana White. 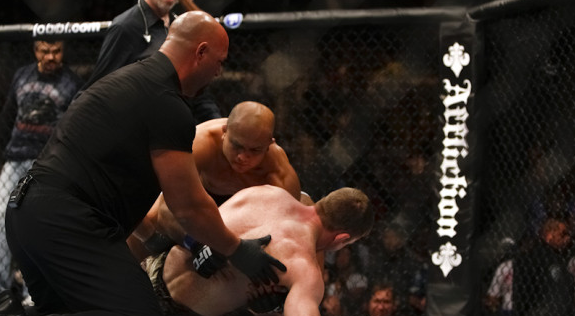 At UFC 123, Matt Hughes was inflicted with one of the most devastating knockouts from BJ Penn. Because of that, the latter got another welterweight clash by Dana White. Penn used all of the remaining 21 seconds in the first round to dispose one of the best 170 pounder in UFC. He dumped his opponent on the floor with a vicious right hand, followed by several more punches afterwards. BJ Penn handed Hughes his first first-round knockout in almost a decade. And after the roars from the Michigan crowd died down, Dana White revealed that BJ Penn will face Jon Fitch next. Where is Matt Hughes Headed to?